Gino d’Ambrosio’s mum is the typical Italian cook. She bakes pizza, prepares pasta, rabbit ragout, salami and tiramisu for dessert for the 27 people of her family at gatherings. This shows what kind of a character she is and the taste of good things she transmits to the children and grandchildren. When you enter her son’s butcher shop, you understand straight away that he belongs to the tradition. He sells not only meat but also the essential ingredients to his family’s homemade specialities: Parmiggiano and coffee, white truffle olive oil, balsamic vinegar and spices. Who likes this exotic meat, I asked. I admit, myself, unless somebody cooks something for me, I wouldn’t be inclined to buy some. Unusual meat represents roughly 25% of his sales. “The consumers are between 25 and 45 years old. First, they want to give it a try. Usually, it is to arrange a surprise for overseas relatives, to let them have a taste of Australia. Once they have had it, they come back to it. But then older people stay away from new food experiences,” Gino laughs. In the shop, I noticed some meditation books lying on a display cabinet just above a shelf of sharp knives. I expressed my surprise. “Oh these are written by one of my clients. I offered to sell them for him. My own meditation is quite different. It happens when I am on my motorbike, an Italian Ducati.” Out in the country, he rides on his 50 acre property. No animals on it. Just the feeling of freedom and distance. An Italian-Australian mixed interpretation of happiness. 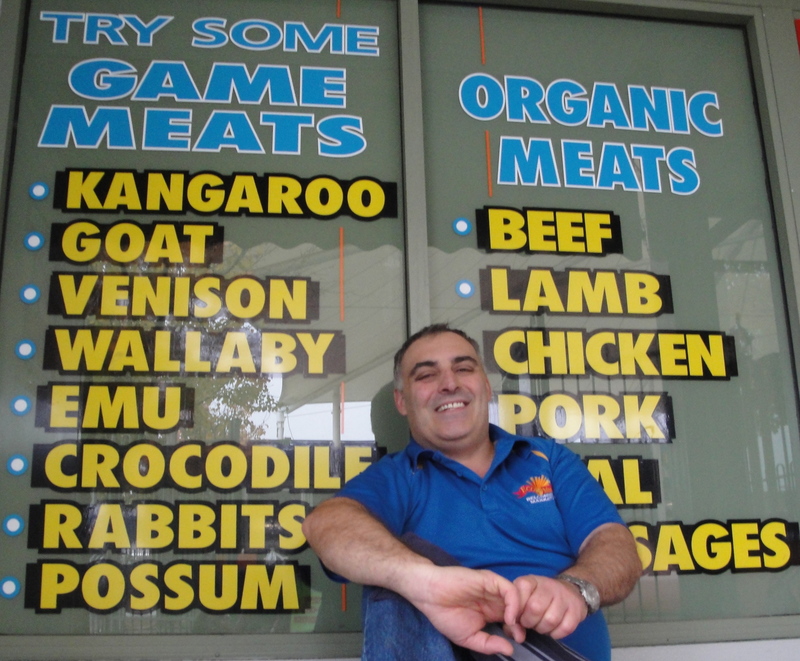 This entry was posted in Canberra, Salt and pepper and tagged butcher, Canberra, crocodile, food experience, Gino d'Ambrosio, Italian, kangaroo, meat, organic, possum, wallaby. Bookmark the permalink.